I am currently sitting in the Library, staring at the book I have to write a paper on. Instead of being smart and completing my homework now so I can enjoy my weekend, I am thinking about how little I have been knitting since I moved to college. It hasn’t completely been nonexistent but the only thing I have accomplished since getting here is finishing the second Noro Sock. Most on which was done in the car on the ride here or while I was home for the weekend, which does not count. They are very pretty however and someone lucky will be getting them for Christmas. 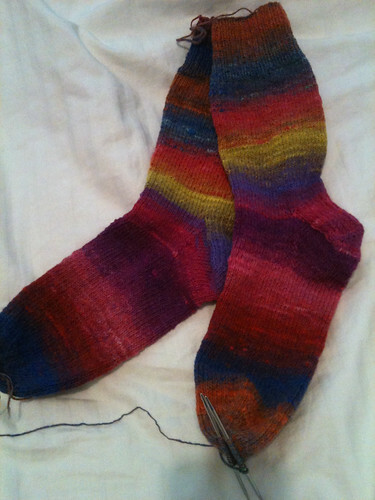 Since then I have tried and failed three times to cast on a new pair of socks but the gauge was always off. I am considering the fact that I just don’t care for the yarn but still refuse to change, insisting that they will become socks despite my aversion to acrylic yarn.